Sewage digester buildings will overlook Barretto Point Park under DEP’s plan to expand its water treatment plant in Hunts Point, Bronx. Image: DEP. DEP agrees to work with local community to address its concerns. On September 10, 2007, the City Council approved the Department of Environmental Protection’s plan to expand its water treatment plant in the Hunts Point section of the Bronx. 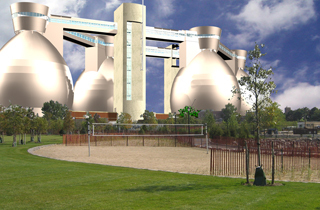 Under the plan, DEP will construct two, 130-foot tall, eggshaped digester buildings, which will convert raw sewage sludge into fertilizer. The plan also includes a 1.2-acre staging area that DEP will use for construction and then eventually transfer to the Department of Parks and Recreation as an addition to the newly-opened Barretto Point Park, which Parks built on former DEP land. In July, the Planning Commission unanimously approved the plan, particularly expressing its approval of the addition to Barretto Point Park. 4 CityLand 106 (Aug. 15, 2007). At the Council’s public hearing, however, the Subcommittee on Landmarks, Public Siting & Maritime Uses focused primarily on the expansion’s impact on air quality. Representatives from the Bronx Borough President’s office and Sustainable South Bronx joined local residents to argue that the current odor from the plant will only get worse if the plant expands. They urged the Council to delay approval of the expansion until they get assurances from DEP that it will work with the local community to address odor and air quality issues in a timely manner. The opposition also asked that the digester buildings be located well within the interior of the current site, away from Barretto Point Park, so that their presence would not overshadow the park. In its testimony, DEP said it will combat odors by installing monitoring equipment, soliciting feedback from the community, and following the recommendations of its consultants. It also argued that the digesters must be adjacent to the park because alternative locations were cost-prohibitive and impractical. DEP then cited its final environmental impact statement, which states that although the digesters admittedly impact Barretto Point Park, they would only cast shadows over it for three-and-a-half hours daily during the spring and summer and one-and- a-half hours during the winter. While many Council members expressed concern over DEP’s expansion, the Council nevertheless approved the proposal. Council Member Maria del Carmen Arroyo, whose district includes Hunts Point, brokered a supplementary agreement with DEP to ensure the agency takes effective odor management measures in order to address the issues raised at the public hearing. The subcommittee approved, sending it to the full Council, which voted 48-0-0 to approve. Council: Hunts Point/Barretto Point Park (Sept. 10, 2007).